If you parked on the east side of the highway (Falling Waters Trail/Old Bridal Path Parking), walk through the underpass to the other side of the highway. Kinsman Mountain is the highest peak in the Kinsman Range, which stretches from Kinsman Notch to Cannon Mountain and makes up the west boundary of Franconia Notch. The mountain's two peaks, both of which qualify as 4000-footers, are designated North and South Kinsman. North Kinsman's pointed peak provides a stunning directional view across Franconia Notch to the Franconia Range, while South Kinsman has a more restricted, but complete view. 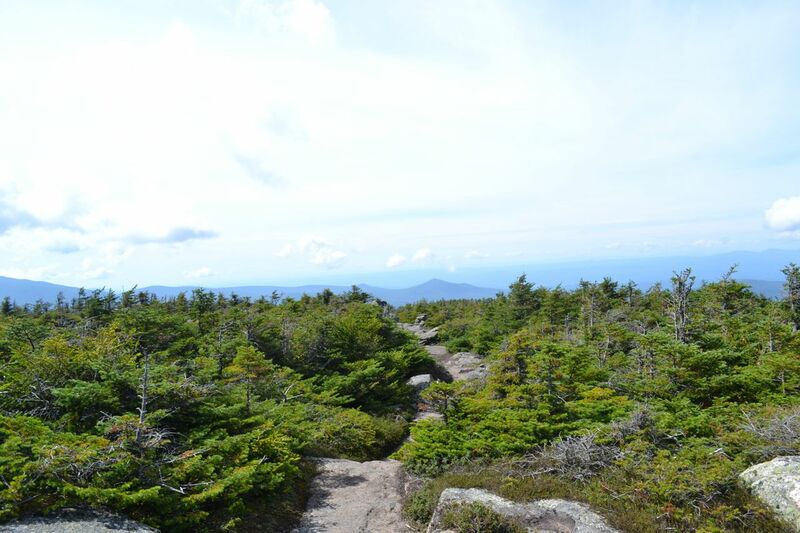 Although 1000 feet shorter than the mountains across the notch, the ups-and-downs in the middle of the Fishin' Jimmy Trail make the hike to the Kinsmans longer and more rugged then that to the Franconia Ridge. That being said, it is also very scenic and rewarding hike, passing two picturesque mountain ponds and many good viewpoints. The trail starts at the Lafayette Place Campground. Cross the bridge over the Pemigewasset River and head up the campground road. Follow the signs for Lonesome Lake Trail through the campground for 0.2 miles, then turn right where the trail enters the woods. The trail crosses a bridge and heads easily uphill, soon crossing another bridge. Pass Hi-Cannon Trail on the right in 0.2 miles from the campground. The trail climbs gradually, angling across the mountainside on the first of two very long switchbacks. The trail soon becomes rougher, then turns the corner into the next switchback. After a rocky, but not too steep climb, it straightens out and heads toward the lake. It meets the lake at a trail junction 0.8 miles from the last one, where the loop begins. There is a good view across the lake from here, looking up to a higher plateau just below South Kinsman. Turn left onto Cascade Brook Trail. The loop heads through the muddy forest around the lake on boardwalks. In 0.2 miles, continue straight onto Fishin' Jimmy Trail as Cascade Brook Trail goes left. It then emerges at the prime viewpoint of the lake, a bridge over the outlet, at a small wooden dam. From here, there are gorgeous views over the water to the Cannonballs and off to the distant Franconia Ridge. The reflections of the mountains in still water are picturesque. If there are no other hikers at the lake, this is a very peaceful place to spend some time. The trail continues around to a dock, where there is a better view of the Franconia Ridge. From here, turn left onto the Fishin' Jimmy Trail and head up a few staircases to Lonesome Lake Hut. Now the trail traverses a mile-long section of tiring undulations, including several rock scrambles, at the end of which there is no net elevation gain. Toward the end of this section, the trail enters a mossy valley. After it passes two small cascades, the climb begins. Along the ascent there are alternating sections of flat trail and short, steep rock scrambles, many of which are aided by wooden ladders, steps, or footholds cut into the rock. At the end of this 0.8 mile climb, the trail levels out, passes through a bog on bog bridges, and reaches Kinsman Junction in another 0.2 miles. From here, turn left onto Kinsman Pond Trail to make a short and worthwhile side trip past several campsites and a shelter to Kinsman Pond, a lovely lily pad-covered tarn beneath the sheer cliffs of North Kinsman. Relax on a lakeside rock before resuming the ascent. Back at Kinsman Junction, turn left (straight across from where you came up) onto Kinsman Ridge Trail. Now all that remains is a half mile-long rocky climb, easier than the first, but still significantly difficult and involving several difficult rocky sections. Pass over the small summit and descend to the cliff-top viewpoint, reached by a spur path on the left. From here, there is a splendid vista across the notch to the mighty Franconia Range. With binoculars, you may glimpse the crowds of hikers on the rocky mountaintops. There is also a view north to the distant mountains in the Great North Woods and nearby Cannon Mountain, as well as a look to the south, down the notch to the Waterville Valley ranges. You can look straight down on Lonesome Lake, and with some effort, Kinsman Pond. Between the Kinsmans is another mile of rough terrain. The descent from North Kinsman is extremely steep; the ascent of South Kinsman is more moderate. From South Kinsman, there are views in all directions, but they are partially blocked because of the wide summit area. To the south, giant Mt. Moosilauke looms over hidden Kinsman Notch. To the west is the flat expanse of Vermont. To the north, you can look back at North Kinsman. The view to the southeast has opened much from what it was at North Kinsman. You can see a great deal of the Sandwich Range, as well as the Osceolas, Mt. Tecumseh, and Mts. Hancock and Carrigain. Bondcliff now peeks above the ridge connecting Little Haystack Mountain with Mt. Liberty. There are various areas around the summit from which better perspectives in certain directions can be gained. There is a boulder on the east side which lifts you above the fir trees for a superior view. Exploring the top will allow you to find the best places for enjoying the views. The highest point is marked with a large cairn, which has recently been shaped into a chair.